We’ve all been there. You keep staring at the clock, wishing that you had some sort of super power that could make the minutes fly by. You are listening to the same speech about productivity that was given to you at last week’s meeting. You are even pretty sure that one of your co-workers may be wearing the exact same outfit from last week’s meeting. But meetings do not always have to be long, boring conversations about how to be proactive. 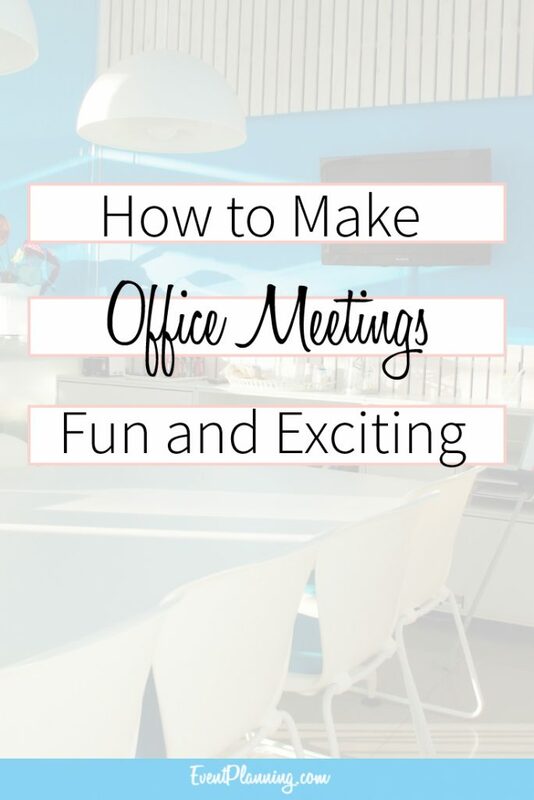 In fact, meetings can be downright fun–when they are planned in advance to be more enjoyable. Nobody wants to sit through a tedious meeting – and as a meeting planner, it’s often your job to figure out ways to ensure that this does not happen. 1.) Get Social – Involve All Employees! One of the reasons meetings tend to drag is due to the fact that we are in the same room for an extended period of time, often listening to the same information. Meetings are a lot like lectures; some of the best classes that we take are not the ones where we simply sit and listen to a teacher tell us information, but where we have the opportunity to discuss the information and offer our opinions on it. Encourage your employees for their feedback, as well as ask for any ideas and suggestions they may have to increase productivity (or on whatever topic it is that you are discussing). Meetings are also a great time to have your employees get to know one another, so consider starting your meeting 10 minutes earlier than when it actually starts to give your employees time to chit-chat with one another and relax before the meeting. Most meetings are held around a table in a stuffy conference room. When people are forced to sit for too long, they often become restless – and their mind begins to wander. To cut back on this sort of behavior, and to make the meeting go by faster, consider removing all chairs from where you are planning to have the meeting, and have your employees stand. This will make your meeting go by faster and will also help your team focus on what is being said. Nearly everyone likes to eat, and will usually be more motivated to attend meetings if there is free food. Think about it: how many information sessions have you attended because you knew that free food and drinks would be provided? Depending on what time your meeting is, be sure to bring food. For instance, if you tend to have your meetings in the morning, bring breakfast pastries and coffee for your employees to enjoy. For an added bonus, and to encourage a bit of friendly competition among your employees, start a ‘rotating catering’ program. In this ‘rotating catering’ program, have each attendee bring a different sort of dish. Then have the group vote on who brought the best dish, and that employee wins a ‘Best Cook of the Week’ award. This exercise works particularly well with a specific type of food, such as different breads or pastries. Remember, well-fed employees are often happier than those who are not. This technique works particularly well when new information is delivered during a meeting, such as a new company policy or sales strategy. After you deliver this important new information to your employees, divide them into small groups and challenge them to create skits, songs, dances, etc. that incorporates the new information that they have just learned. This will help ensure that your employees have retained the information and will help make the meeting more fun. For an added bonus, have the entire group vote on who had the funniest skit, the most creative, etc. Another reason that meetings feel so stifled is because they are often held in the exact same place, week after week. For a change, try holding your meeting in different locations. These locations do not have to be incredibly exotic or far away–they can be as simple as holding the meeting outside under a large tree or having your group walk together to a local coffee shop and having the meeting there. The change of venue will not only be a nice change of pace for your employees, but being in a new setting may actually bolster creativity and help your employees to think of new ideas to contribute to the meeting. Just simply be sure when you do this to ensure that your new venue knows the exact number of people who are coming and is able to accommodate you and your team as needed. One way to help get your team’s creative juices flowing is to play a game. You can either start off your meeting with a fun brain teaser, or have the game halfway through – depending on how you would like the flow of the meeting to go. A few fun and productive games you can play with your team includes completing a crossword puzzle together or a fun puzzle, or can be as creative as having a ‘hat parade.’ During a ‘hat parade,’ bring in a box of fun hats for your team to try on and have them reflect on the perspective of the person wearing the hat. There is no limit to the different types of games that you can play with your employees. For additional ideas on fun meeting games, read The Big Book of Creativity Games: Quick, Fun Activities for Jumpstarting Innovation by Robert Epstein, and Gamestorming: A Playbook for Innovators, Rulebreakers, and Changemakers by Dave Gray, Sunni Brown and James Macanufo. 7.) Have a Dance Break! Halfway through your meeting, have an exercise/dance break. Play upbeat music and lead your group in a series of stretches, jumping jacks, running around the room, dances, etc. – whatever you feel will get your employees hearts’ pumping. For an added challenge, appoint a different ‘exercise leader’ every week, who’s duty is to lead the group in their own unique exercise routine. Exercising halfway through a meeting will not only help break up the monotony and make the meeting more enjoyable, but may also help get your team to generate new ideas while exercising. It’s no secret that we often doodle during meetings. But instead of discouraging this sort of behavior, set a certain period of the meeting where you have your team sketch out their ideas. These sketches do not need to be artistic masterpieces – these sketches are to simply help your employees flex their creative muscles as well as help those express their ideas who are often too shy to. For an added artistic challenge, bring in play-do and have your employees turn their ideas into mini-sculptures. There is nothing worse than staring at slide after slide of a dreary PowerPoint presentation. While PowerPoints are often a necessary tool used during meetings, there is no reason to make it so monotonous. To make your PowerPoint presentation more interesting, try limiting the words on each slide to just five or six, and instead include lots of graphs, pictures, and videos. Be sure to show, and not just tell, your presentation, and to include images that will help illustrate your main points. Look for images that will get a reaction from your group, as well as for videos that can help start a discussion. And finally, as you craft your PowerPoint presentation, try using vibrant colors such as reds and purples to catch your team’s eye and their attention. Think of your PowerPoint presentation as an advertisement – do you react stronger to advertisements with rather mute colors, or to those with vibrant colors and texts? 10.) Celebrate and Reward Success! When your team has something to celebrate, such as landing a new account or finishing a project ahead of time, be sure to acknowledge their accomplishment with a mini-party. Bring in a bottle of sparkling cider and plastic champagne glasses and toast the employee who made this achievement. For an added treat, order a delicious cake for your team to enjoy. If your team has accomplished a particularly impressive goal, consider hiring a professional masseuse to give fifteen minute back and neck rubs to each employee. Most people often react more positively to encouragement rather than negative reinforcement, and your employees will appreciate it if you reward their hard work rather than constantly point out where there is room for improvement. Not all meetings have to have an exact point to them – some meetings can just be a way of thanking your employees for a job well done! (Which nearly always results in a fun and exciting meeting). If you like this post, check out the Top 10 Team Building Activities.